Instagram is hot right now. Vibrant imagery. Stories. IGTV. Users are heading to the platform to be inspired by content created not only by family and friends but brands too. Over 500 million Instagram accounts worldwide are active daily. And 80% of accounts follow a business. Today, it’s not a question of whether you should be using Instagram, but how you should be using it. So how can brands expand their reach and best drive results? We went to Bannersnack Content Marketing Manager and CMI blog contributor Robert Katai. 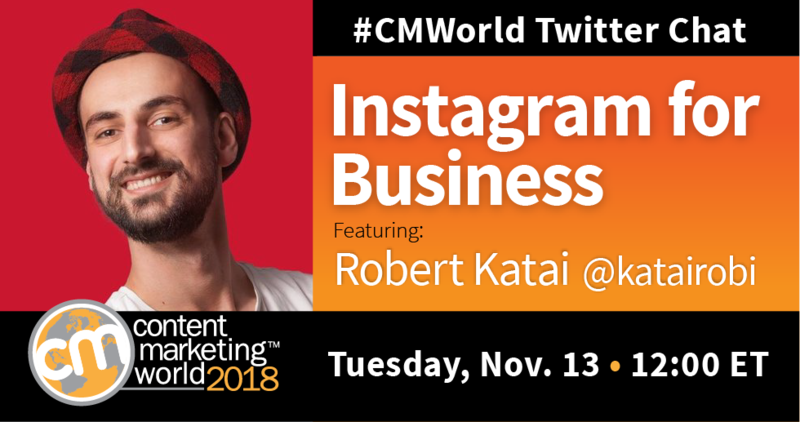 We had a fast-paced #CMWorld Twitter chat with Robert, as he and many members of our community shared their experiences with Instagram. A look at two of our most-talked about questions is below. For more tweets and responses from the discussion, check out our Twitter Moment. If your product/service/industry is not highly visual, can Instagram still be useful for content marketing? Photos, videos, going live: How do you know if Instagram Stories is best for your brand? How much effort should you devote to content that disappears after 24 hours? How are you leveraging Instagram? Are there brands doing it right? Let us know in the comments below. Can you picture yourself on the Content Marketing World stage? If you said “yes,” then why not consider applying to become a CMWorld speaker. We’re accepting session proposals until December 14.